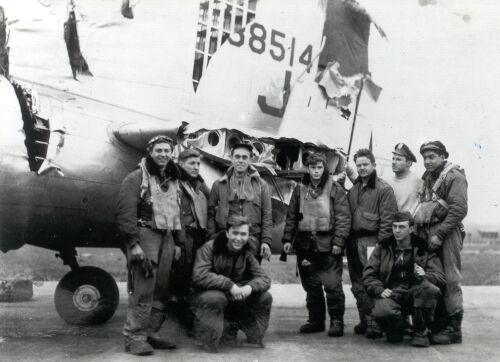 I am one of the 100th Bomb Group pilots that flew three Operation Manna missions over The Netherlands. Following are my recollections of the event. "The agreement with the German area commander required that we stay under 500-feet, remain within strictly mandated corridors, and not carry gunners aboard our B-17s. No one felt any better when our pre-mission briefer added, "Anyone fired upon will receive credit for a combat mission." The modified bomb bays were loaded with boxes of ten-in-one rations and on May 3rd we flew our first mission. We went in at wave-top level, hopped over the dykes, and skimmed by telephone poles in an effort to stay as low as possible. German flaks batteries where everywhere and we kept a wary eye at the gunners who squinted at us like duck hunters waiting for the season to open. Early May is tulip time in Holland and despite the ugly scars of war, carpets of blazing colors dotted the countryside. Joyful women and children were everywhere. Some waved American and Dutch flags at us while others pointed to messages in open fields that read, "Thank You Boys," and the like. Near Amsterdam we "bombed" an open field centered with a white cross that appeared to be fashioned from bed sheets. Below us, it was a free-for-all as civilians with German soldiers among them could be seen scrambling for boxes as even more of the 50-pound missiles showered down. On May 5th, we repeated our performance over Bergen and were again treated to the heartwarming sight of mothers hugging their children as they pointed to the big grins on our faces." Although, I flew 26 combat missions over Germany, among all of my wartime experiences those three missions are among my most treasured memories.